Anchorage has been rainy for the past few weeks and I have unashamedly been staying home and enjoying it. It’s hard for me to believe, but last week I stayed home for 2 days straight, never left, and actually really enjoyed it. The older I get the more my appreciation for each stage of life grows. Being single and independent was awesome, for a while, but then it started to get lonely. Then comes marriage which is even better than being independent. You get to share life with someone and make memories then look back and reminisce of adventures shared. 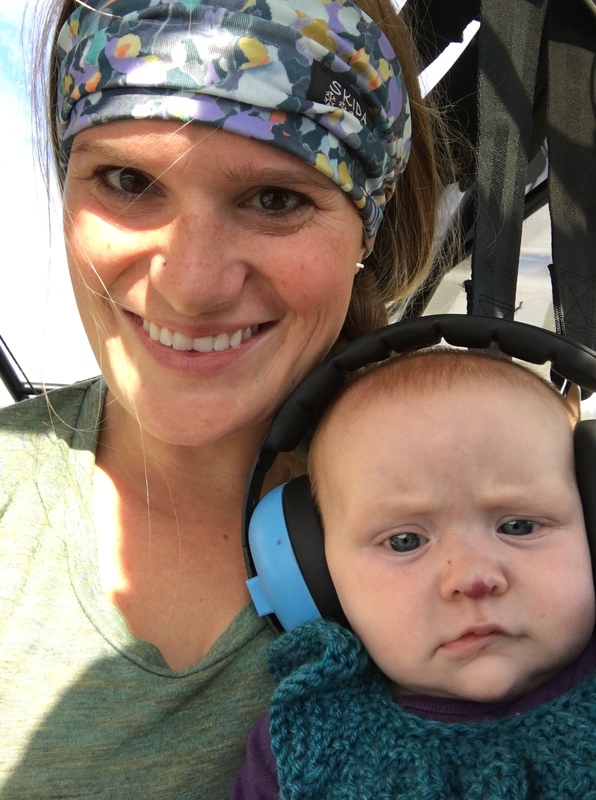 Having kids is really on a different level, and no matter what anyone tells you, no one can really prepare you. 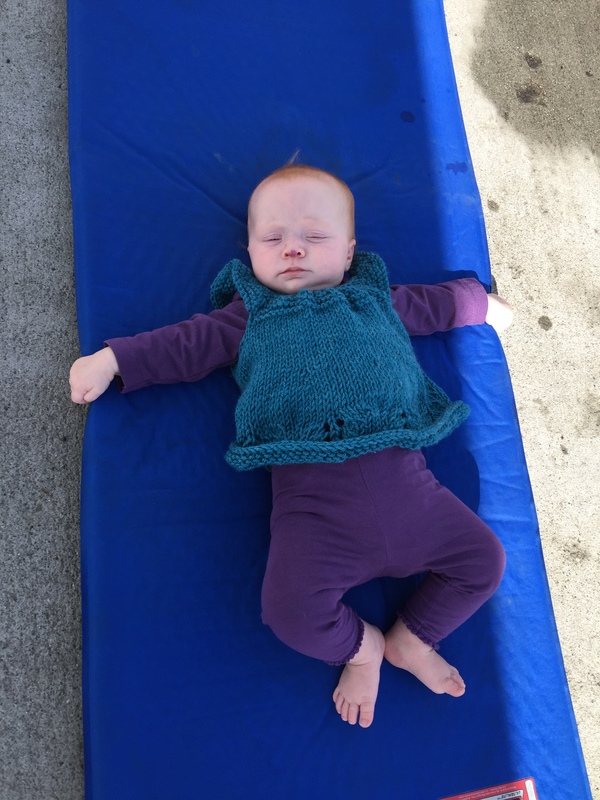 All I can say is that I highly recommend becoming a parent, it is by far the best stage so far. I would have never guessed that staying home and coaxing out a giggle could be so fulfilling, but it is. Feels good to be back in the cub with my favorite lap child. “Pilot, baby got sick” a bit of an inside joke from when Woodsen was flying out in the Bethel area. I hope this isn’t a taste of what’s to come. The airplane still puts Atlee to sleep. It wasn’t long before Kenny arrived with our clean and no-longer-stinky walrus head. 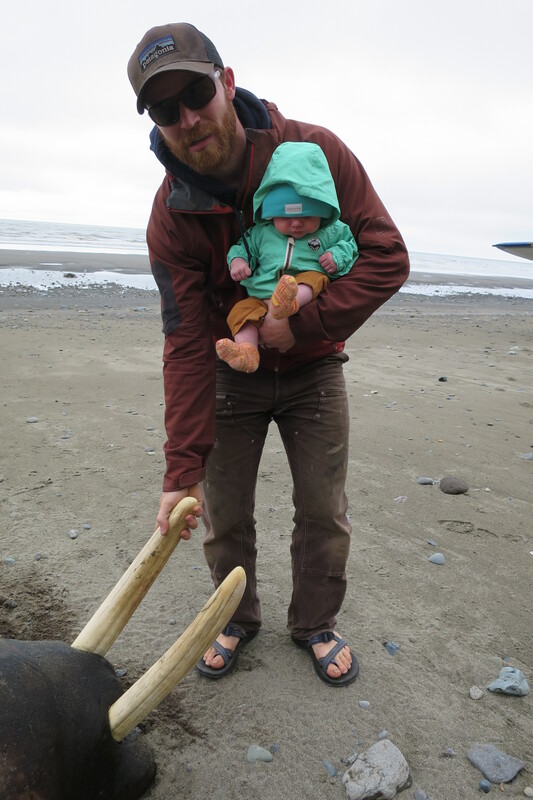 I’m guessing you are more curious as to how we got a walrus tusk then you are about our journey to an Alaskan city that you can drive to. Fair enough, lets rewind to the middle of June this year when we were on our yearly trip exploring Alaska. 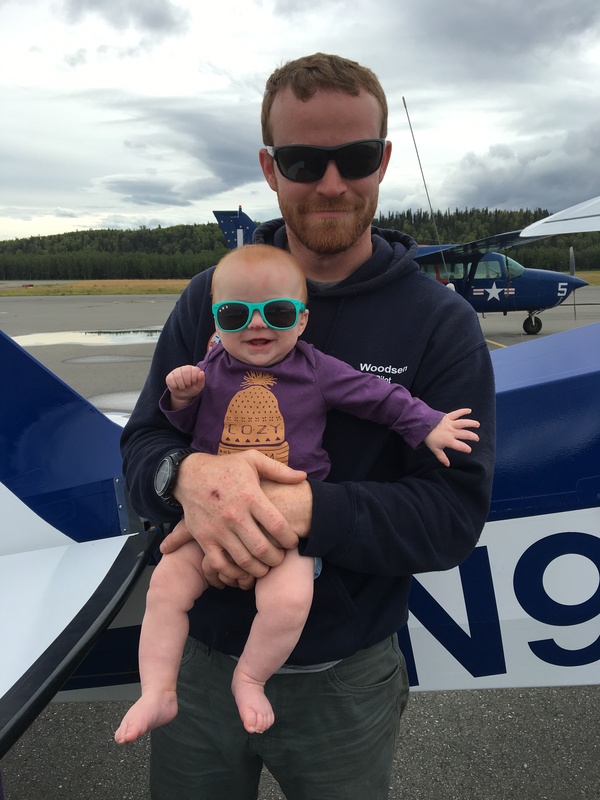 We had just spent the last 3 days in Naknek waiting out weather and we were excited to finally head out. 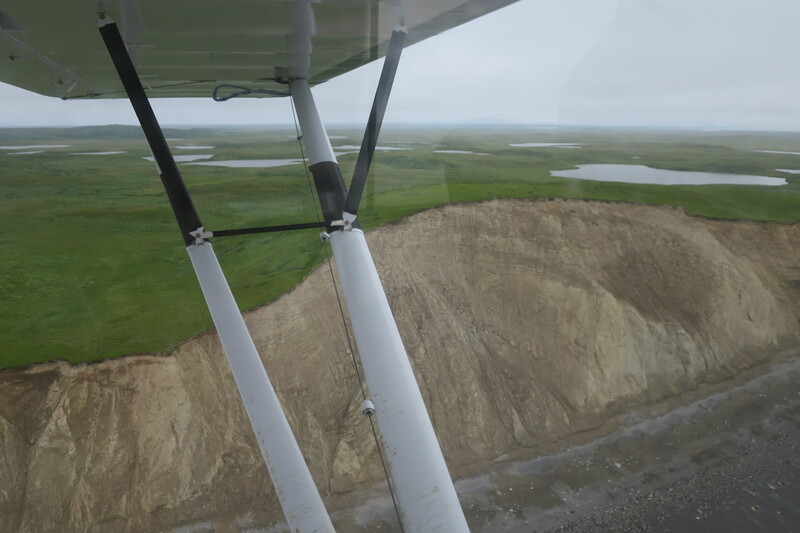 A local pilot told us about a big haul out of walrus they had seen near Egegik so we decided to fly over and take a look before heading inland to the Valley of 10,000 Smokes. 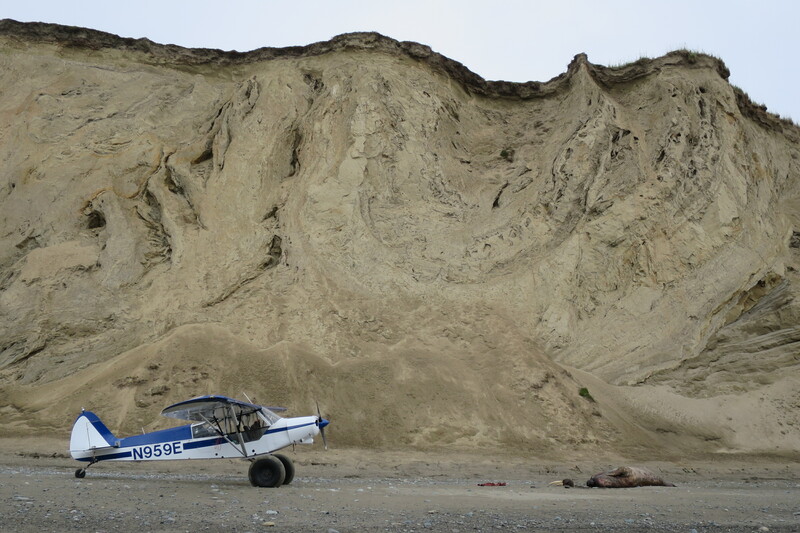 Flying the coast we spotted a few dead walruses with four wheeler tracks around them and their head and tusks missing. It always amazes me how you can feel so out of reach from civilization but then you look down and see what appears to be a four wheeler road on the beach. 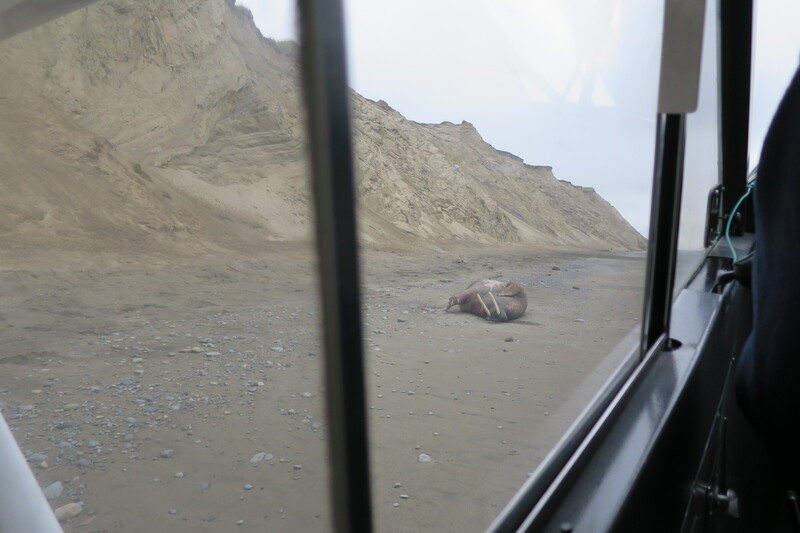 We never found the haul out of walrus, but right before turning inland we spotted a dead walrus with his tusks pointing straight up at us. We decided to land to check it out. 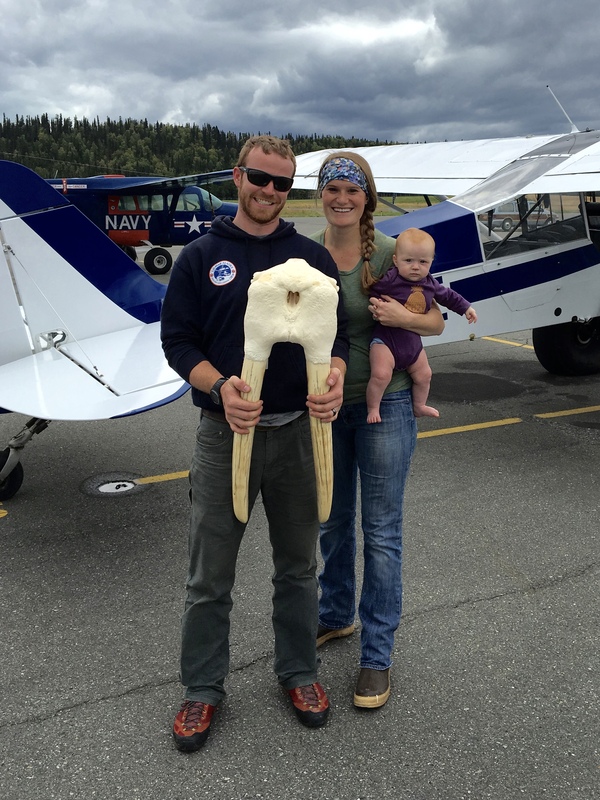 Most any tourist can figure out a way and pay enough money to get a trophy bear, sheep or moose in Alaska, but it’s pretty unlikely for a tourist to take a pair of walrus tusks home to hang on the wall. So in a way its kind of a special Alaskan souvenir. Atlee took in all the sights and smells of a rotting walrus and was still content and wanting to eat. At this point, eating was pretty much the last thing on my mind, and that’s coming from an emergency room nurse . 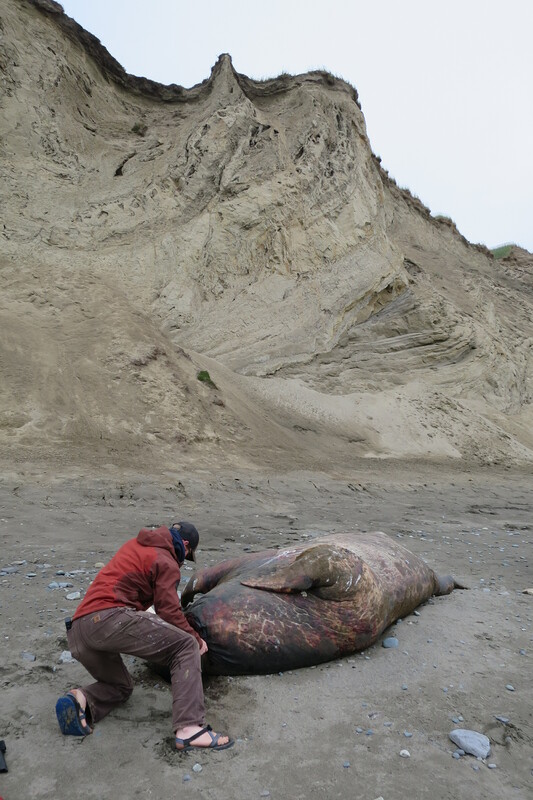 Finding a walrus is the easy part. The hard part (and yes, it gets even stinkier at this point too) starts when you start to cut off the head. This is especially true when you didn’t come prepared to hack off the head of a walrus and only have a hatchet, small knife and bow saw. Success! Now what are we going to do with that stinky, heavy gelatinous thing? Here is the answer. 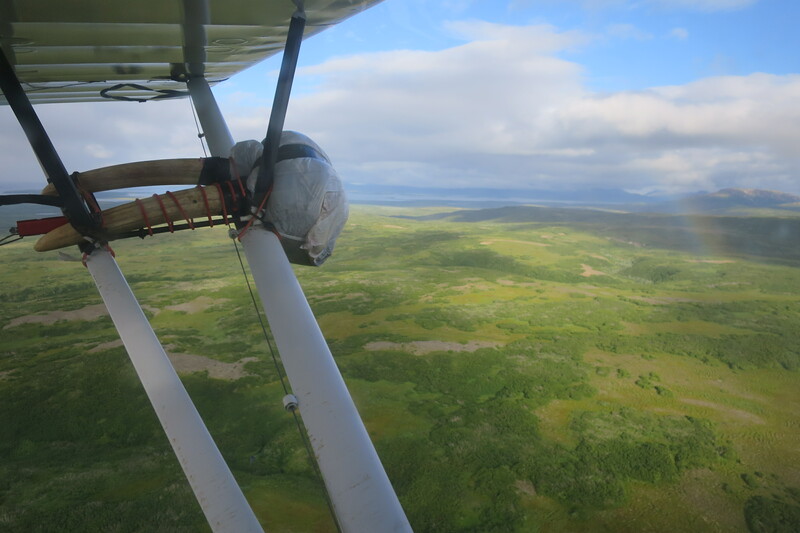 Strap it to the wing and pray that no bears attack you while camping in Katmai with a baby and a stinky walrus head strapped to the wing. Off we go to the Valley of 10,000 smokes. Later that day we stopped at what we thought was a friend’s lodge in Iliamna, it turned out not to be, but we met the Bath’s and over a cup of tea discovered that the strip where we had landed was shared with Chet & Darcy another couple we knew from the Geocache. One of my favorite parts of our visit to the Baths was John Bath’s recommendation on how to decapitate a walrus. “Next time just use a shotgun, five shots and you’re done. Works great especially if the tide is coming in and you need to get out of there fast”. Well, that’s one way to do it I guess. 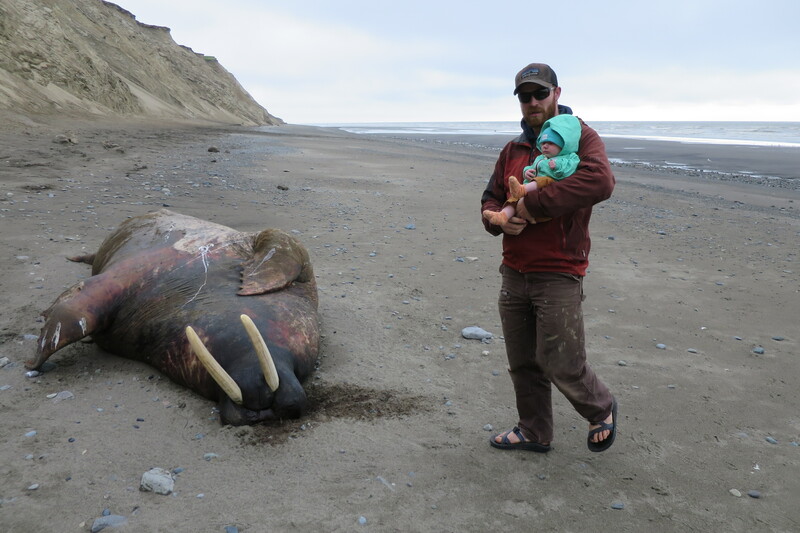 A couple things to consider when looking for walrus tusks. 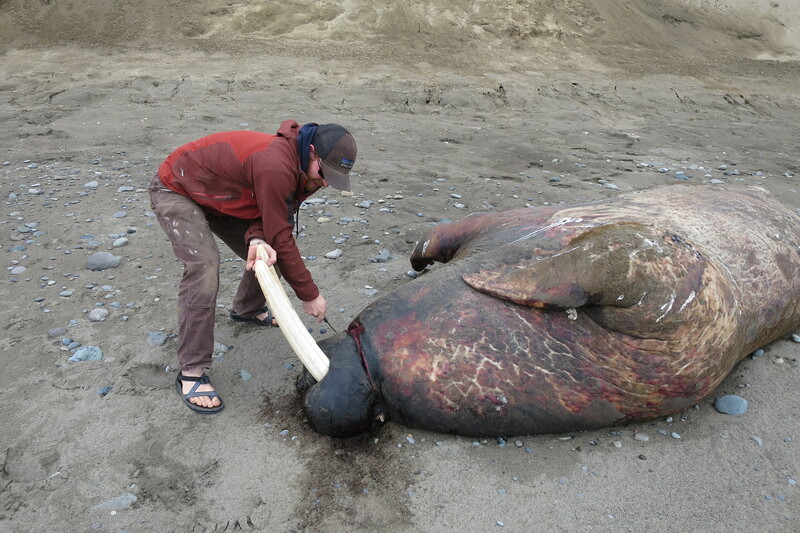 Know the rules and make sure to get your tusk sealed within 30 days. 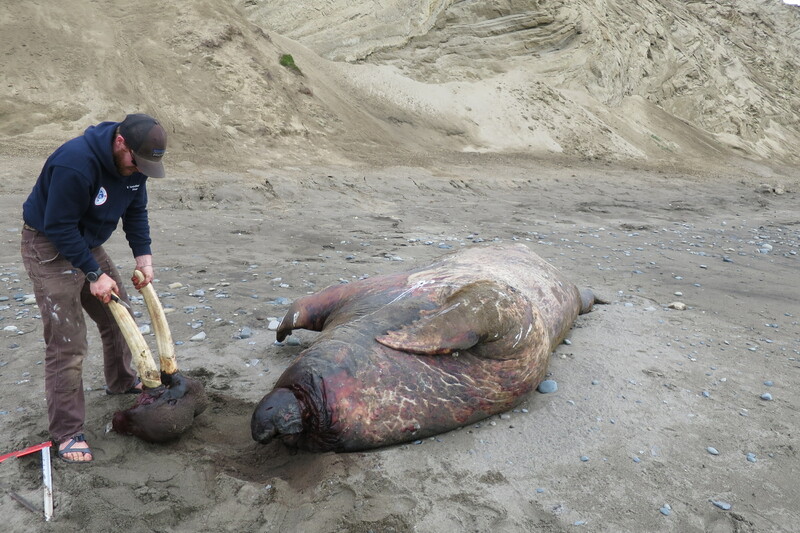 Here is a link to the basic rules concerning harvesting walrus tusks. 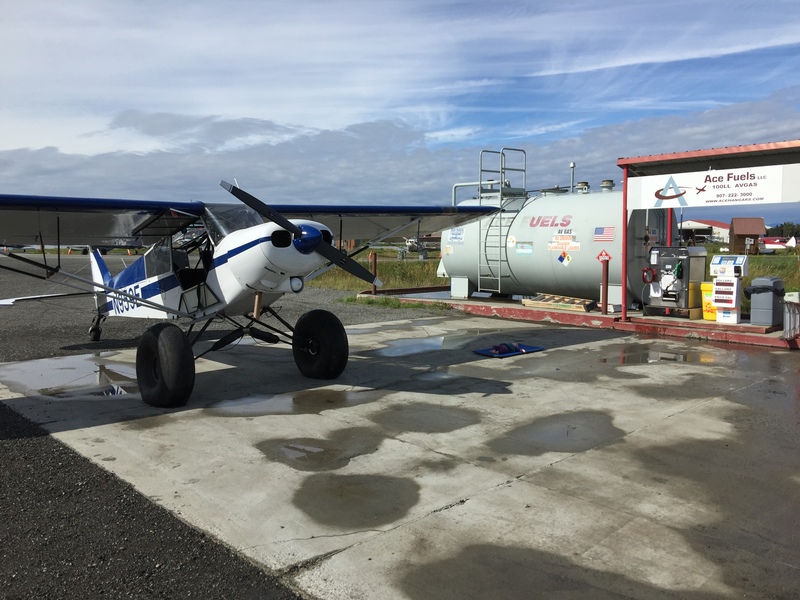 Bring a good knife (or a shotgun), garbage bags, duct tape, gloves (the long kind if you can get them), bungee cords (to strap it to the wing strut) and some really good soap to bath yourself with after its done. Don’t forget the lower jaw. We would have liked to have cut it out but with our tiny dull knife we weren’t up to the task. Consider where you are going next. 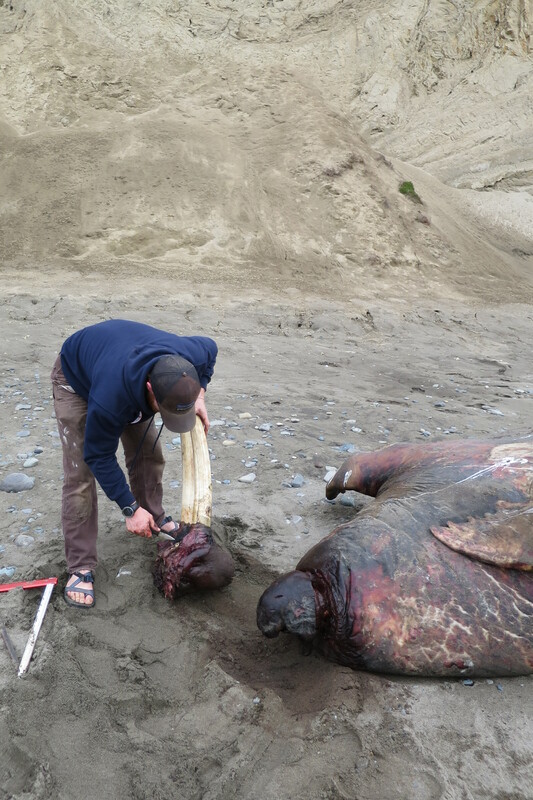 Camping in bear infested Katmai the next night? 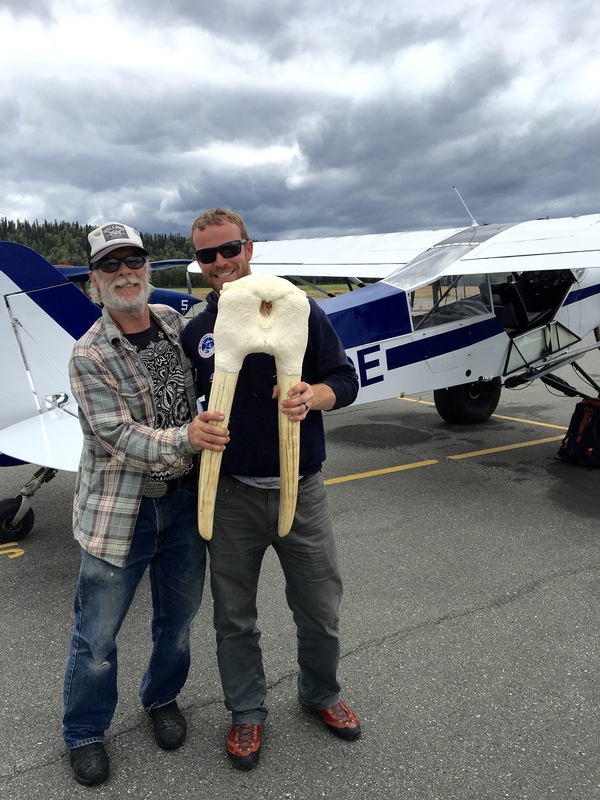 Might not be the best idea to have a stinky walrus tusk strapped to your plane. If you are in the middle of a trip consider shipping it home in the closest town. That was the best 45 dollars we’ve spent in a while. Don’t forget to bring it to Kenny Jones at Skulls & Bones in Soldotna (907) 250-6592.